Metso's service experts have managed to significantly reduce the downtime needed for replacing pinions and gears for 33 rod and ball mills by working closely with the customer at Codelco's Chuquicamata division in Chile. 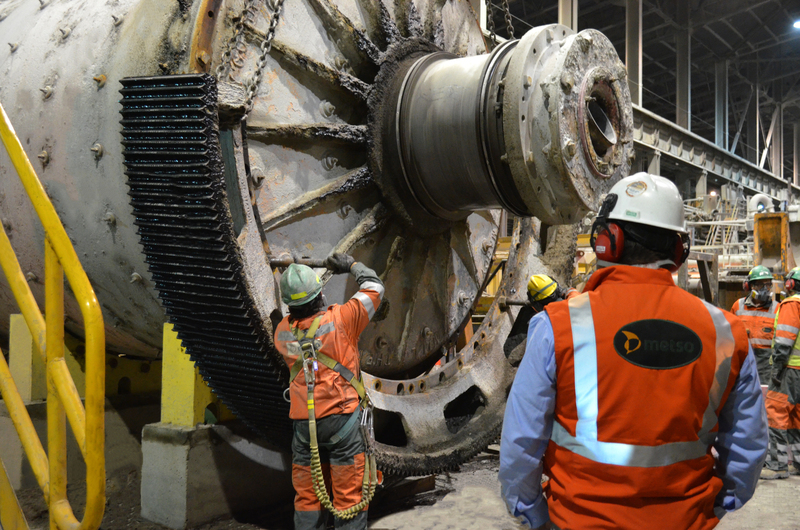 Metso has an on-site team of some 30 service experts working for the division's largest mill overhauling project. Caption: Highly qualified Metso staff replacing pinions and gears in Chuquicamata, the world's largest open pit mine. The services contract has been running for more than a year now and it includes replacing of pinions and gears for 21 ball mills and 12 rod mills for two concentrator plants. So far Metso's service experts have managed to reduce the downtime needed for the service work by ~50%, going down from 8 to 4 days in the case of ball mills, and 14 to 5 days, meaning a reduction of 64%, in the case of rod mills. Further to this, Metso specialists have carried out mantle repairs and as a consequence the expectation is that these stay in perfect working condition until the next servicing in 60 months' time. All work has been carried out with zero accidents and with top marks in audits performed by the customer. "Obtaining these results confirms to us the good work being done up to now, indicating to us that future stages will be the same or even better. Safety is inherent to all our business projects, as it acts as a social tool which allows us to show the respect we have for people and their wellbeing, as well as successfully directing operations, which in itself reduces accident rates, something which is paramount in all actions we do as a company", stated Roberto Escobar, Project Manager and Contract Administrator of Chuquicamata Division, Codelco. "This outcome is an example of our service team's constant, methodological and systematic efforts. The project demonstrates our long experience and deep know-how in services. Significantly reducing the downtime needed for service and the achieving of the customer's safety indices shows our passion for working closely with the customer to achieve common goals. With an average downtime reduction of 64% in assembly, we have demonstrated our high level response capabilities when dealing with upgrades and equipment servicing, as well as assembly of new equipment" commented Juan Zuleta, Field Services Manager at Metso. Codelco is the largest mining company in Chile, as well as being the most prominent state enterprise in the country. Chuquicamata Division, one of its oldest mines, operates through two extractor plants, Chuquicamata and Mina Sur, from where mainly copper and molybdenum are mined, reaching an annual production of approximately 339 thousand tonnes of copper cathode, with a mineral purity of 99.9%.